Be the first to share your favorite memory, photo or story of Elisabeth . This memorial page is dedicated for family, friends and future generations to celebrate the life of their loved one. 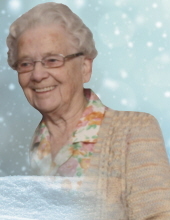 On Wednesday, January 30, 2019 Mrs. Elisabeth Kisters of Mannville passed away peacefully in her sleep at the age of 85 years in the Vermilion Health Centre. Elisabeth will be forever loved and missed by her Dear Companion Garry Flaman of Mannville; Children Heinrich Kisters of Moose Jaw, SK, Conrad Kisters of Derwent, AB, Gabriella (Bob) Lewin of Maple Ridge, B.C., Michael (Monique) Kisters of Biggar, SK, Albert (Melanie) Kisters of Derwent, AB; Grandchildren Wesley (Patricia) Lewin, Amanda Lewin (Steve Darby), David and Jesse Kisters; Great-Grandchildren Sophia, Nolan, Parker, Ellie, Nicholas, Evan and Liam; 1 Brother in Germany; as well as her extended family. She was predeceased by her Husband Albert Kisters in 2011 and Parents Klements and Maria Schuth. In keeping with Elisabeth’s wishes cremation has taken place and a service will take place at a later date. If so desired donations in memory of Elisabeth may be to the Cross Cancer Institute or charity of donor’s choice. "Email Address" would like to share the life celebration of Elisabeth Anna Kisters. Click on the "link" to go to share a favorite memory or leave a condolence message for the family.